This latest offering from the French four-piece Versailles takes the spirit of the classic French symphonics (Ange, Mona Lisa, etc.) and dresses it in a modern suit of heavy armor. Vocalist Guillaume de la Pilière links the present to the past, and although his voice is a bit more gravelly and uncontrolled than Christian Décamps (of Ange), it's still quite evident that there is a major influence here. Lyrics are all in French. Guillaume is also the guitarist and flautist, and on the longer tracks he and the rest of the band stretch out and show what they are made of, a powerful symphonic based rock with a very French feel, dramatic and emotional. They do an excellent job on these instrumental passages, and nobly attempt to do some very complex licks, yet at times I get the feeling they are in a little over their heads. At their instrumental best (eg. the twenty minute "Une Saint Barthélémy Dévote" or the thirteen minute "Dégénérescence obsessionelle") they can call in all the powers and deliver a powerful rock based opus with a complex edge and gripping solos. Shorter tracks like "Exquisite Betise,” "Avec Tous Mes Hommages" and "Viendra L'heure" call up the spirit of the past a bit more, due to their high degree of vocal content — yet the inclusion of both keeps the album from weighing down or becoming too lofty and poetic. An acoustic guitar instrumental "Jadis" flows nicely in the mix as well. One complaint is of the sound quality, of concern only when everyone is playing at once — but which is probably when a listener wants to hear the most. The clarity suffers a bit at some of these power points, yet still it's not as bad as the mix in Deus Ex Machina's Gladium Caeli. Overall, this is a winner, one I'm certain that most listeners would enjoy. It’s amazing how with opinions on bands, even one or two can sway you. 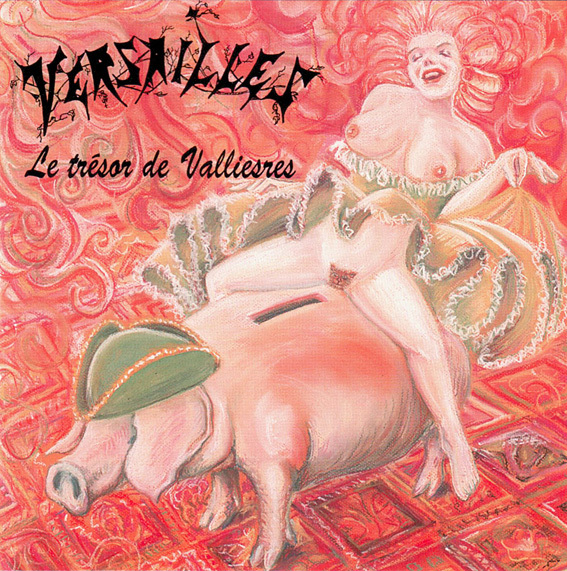 This is French group Versailles' third album, and by the reports of their first album Le Cathédrale du Temps, I was warned to stay far away. This opinion also affected my decision to ignore their Don Giovanni, which was declared by some as a big step up. Their third album here has been quite a talking point in the scene now, and with all the good opinions on this one I'd figure I'd take a listen. I'm very glad I did as well, as this album is by far one of the best I have heard in its style in quite some time. First comparison is obvious in that these guys used to listen to a lot of Ange, which is evident by their contribution to the A Propos d'Ange compilation. Vocalist Guillaume de la Pillière sounds quite a bit like Christian Décamps at time, yet not quite as strong. In fact some of the narration reminds me heavily of the style on the Emile Jacotey album. Instrumentally, all are constantly improving musicians, most notably the keyboadist whose organ chops and synth leads are quite pleasing to the senses. At times the music is a tad sloppy in the rhythm department — not that they are bad players, the fact that they're taking these impressive steps up is more than enough to cover for it. The music is excellent with a good mix of digital and analog (the Mellotron is extremely effective here) keys, and is in a restrained powerful style comparable to Pink Floyd circa Meddle (parts of it are practically plagiaristic — check out the David Gilmour guitar lines a la “Echoes” in “Une Saint Barthélémy Dévote” ) or classic Pulsar ("Strands" or "Halloween"). The music is dynamic, melodic, well constructed with diverse use of sounds and textures. By the time you get to the incredible 20 minute "Une Saint Barthélémy Dévote" I'm sure any symphonic fan will be under its spell. This is great music, and a tribute to a band trying hard to improve in all ways. Excellent and highly recommended (except for the tacky cover).